How Do Birds Keep Warm in the Cold? How Do Wild Birds Keep Warm in Winter? Many birders are astonished at the wide variety of winter birds that visit their feeders even on the coldest days, and they may wonder "do birds get cold?" and “how do wild birds keep warm in winter?” Birds have many superb adaptations that allow them to survive even in the most frigid conditions, and birders who understand what birds need to keep warm can easily help their feathered friends. Birds are warm-blooded animals that have a much higher metabolism, and thus higher body temperature, than humans. While the exact measurement varies for different bird species, the average bird’s body temperature is 105 degrees Fahrenheit (40 degrees Celsius). Body temperature can fluctuate during the day depending on climate, diet, and activity, but it can be a challenge for birds to maintain such a high body heat when temperatures dip severely. 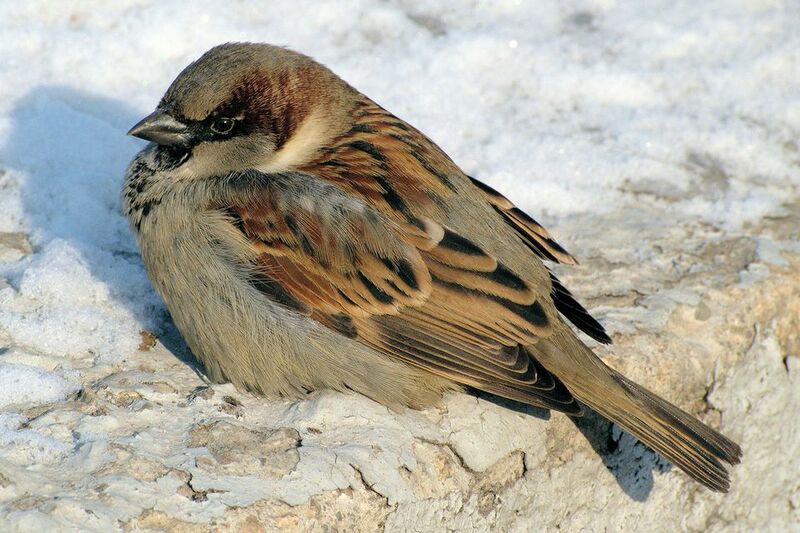 Smaller birds are particularly at risk, since they have a proportionally larger surface area on their bodies to lose heat but a smaller core volume to generate it. Even the smallest birds, however, have several ways they can efficiently keep warm. Birds have many physical and behavioral adaptations to keep warm, no matter how low the temperatures of their surroundings may be. Legs and Feet: Birds’ legs and feet are covered with specialized scales that minimize heat loss. Birds can also control the temperature of their legs and feet separately from their bodies by constricting blood flow to their extremities, thereby reducing heat loss without risking frostbite. Tucking: It is not unusual to see a bird standing on one leg or crouched to cover both legs with its feathers to shield bare skin from the cold. Birds can also tuck their bills into their shoulder feathers for protection and to breathe air warmed from their body heat. Sunning: On sunny winter days, many birds take advantage of solar heat. They will turn their backs to the sun (therefore exposing the largest surface of their bodies to the heat) and raise their feathers slightly. This allows the sun to heat their skin and feathers more efficiently. Wings may also be drooped or spread while sunning, and the tail may be spread as well. Shivering: Birds shiver to raise their metabolic rate and generate more body heat as a short term solution to extreme cold. While shivering does require more calories, it is an effective way to stay warm in extreme conditions, as least for brief periods. Roosting: Many small birds, including bluebirds, chickadees, and titmice, gather in large flocks at night and crowd together in a small, tight space to share body heat. They can roost in shrubbery or trees, and empty birdhouses and bird roost boxes are also popular locations to conserve heat. Even individual birds choose roost spots that may have residual heat from the day’s sunlight, such as close to the trunk of a tree or near any dark surface. Many birds will enter torpor to conserve energy during cold winter nights. Torpor is a state of reduced metabolism when the body temperature is lowered, therefore requiring fewer calories to maintain the proper heat. Most birds can lower their body temperature by a few degrees, but torpid birds have lowered their body temperatures by as much as 50 degrees. Torpor can be dangerous, however, as the reduced temperature also leads to slower reactions and greater vulnerability to predators. Hummingbirds, chickadees, swifts, and other types of birds regularly use torpor as a way to survive cold temperatures. Even with all these adaptations to conserve heat and stay warm, many birds still succumb to frigid temperatures and bird mortality can be very high during severe winters or sudden cold snaps. Birders who know how to keep wild birds warm in winter can help their backyard flocks have an edge over the cruelest weather. Offer Good Food: Offering the best winter bird foods means selecting seeds, suet, nuts, peanut butter, scraps, and other items high in fat and calories to give birds plenty of energy to generate more body heat. Offer Liquid Water: Birds can melt snow to drink if necessary, but doing so will lower their body temperature and use precious energy that is needed to maintain body heat. If the birds can drink from a heated bird bath even in freezing temperatures, they will have a much better chance at survival. Provide Shelter: Plant evergreen shrubs and coniferous trees that will provide suitable shelter throughout the winter, or build a brush pile to give birds a safe, sheltered place to roost. Positioning shelter near windbreaks provides even more protection, and adding a roost box to your yard is also helpful. When temperatures start to dip, it isn’t necessary to worry about how birds keep warm; they have plenty of efficient adaptations to survive even the chilliest nights. Birders who understand those adaptations and help birds with even better food, shelter, and other necessities, however, will be sure to enjoy warm and healthy backyard birds no matter how cold it is outside.